President Obama’s understanding of financial planning is fundamentally flawed. In his latest budget, the chief executive proposed a cap on tax-preferred retirement accounts. An individual’s total balance could not accumulate over $3 million. This total would include the sum balances of a traditional IRA, Roth IRA, 401(k) and defined contribution plans. He did not say how this law would be enforced. But Obama implies the proposal would raise $9 billion for the government over 10 years via some kind of tax. Apparently $3 million is “an amount sufficient to finance an annuity of not more than $205,000 per year in retirement.” We’ve written before about the false promises of annuities and annuity calculators. But clearly Obama needs a refresher. First, an annuity paying out $205,000, or 6.8% of the balance, is an immediate fixed annuity. The annuity company takes the entire $3 million. For the first 15 years it simply hands back your money without interest. During that same period, we would expect continuously held investments to double and perhaps double again. Second, these annuity payments would not increase with inflation. Even if at age 65 your purchasing power began at $205,000, by the time you reached 95 it would have dropped to under $55,000, assuming average inflation of 4.5%. Leaving your future standard of living to the mercy of government monetary policy is foolish. Compare it to thinking that Social Security provides a decent investment return. If you decided to receive a fixed annuity, you should spend a portion of it and put the remainder in investments to supplement your fixed payments and keep up with inflation. A $3 million account might be able to purchase a fixed annuity of $205,000 at age 65. But the quotes we received were all below that. We use a smarter method to compute the safe spending rate from retirement assets. At age 65, your retirement account balance should continue to increase. You will be able to keep enough principal behind to grow at a rate that will both last your lifetime and keep up with inflation. The goal is to take several years before cost-of-living increases begin to reduce its value. At age 65 we compute the maximum safe spending rate as 4.36%. A $3 million portfolio would provide an annual income of $130,800. Each succeeding year, the percentage changes slightly. So your annual income increases with inflation. Using this safe withdrawal rate, the growth rate of your investments over inflation will help you maintain your purchasing power. This is a reasonable retirement but nowhere near what Obama suggests. To have his $205,000 standard of living, you would need at least $4.7 million at age 65. Your account value would have to continue increasing to ensure it kept up with inflation. You may believe the government needs to collect more money in taxes. But this proposal is an awful way to do it. Money in traditional retirement accounts may grow tax free. However the entire amount is ultimately taxed during the withdrawal phase. During that delay, the government’s portion grows at market rates of return. Were the government to collect its portion early, it would forgo years of growth. Government revenues have benefited greatly from these tax-preferred accounts. To suggest that collecting tax and spending this tax more quickly collects $9 billion over 10 years is a suspect claim. Obama’s proposal also penalizes private industry that relies on defined contribution plans. Federal workers are more likely to have fat compensation packages of government-defined benefit plans and pensions. These would not be limited in any way by his proposal. To punish private sector defined contribution plans and reward public sector defined benefit plans is egregiously self-serving. 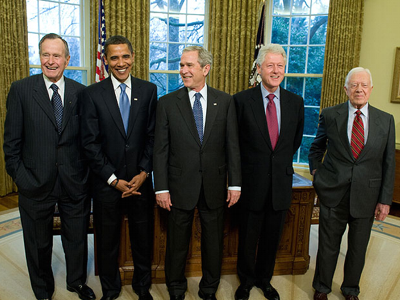 Retired presidents enjoy a government pension that matches the current salary of cabinet members, reimbursement of staff and office expenses, medical insurance and lifetime Secret Service protection. Although difficult to quantify, just the first two in 2012 would be an annual income of $349,700, or an $8 million retirement account. Obama’s own government pension is more than sufficient by his own standard. The best retirement planning keeps income as constant as possible in today’s dollars. Balancing your income over your lifetime also provides some tax-planning benefits. If you work for several years on something and get paid all in one year, your income is pushed needlessly into a higher tax bracket. Our progressive tax code punishes income received in a single year. It favors income spread across many years. When this is achieved, the success of retirement planning and tax planning is not a “loophole.” If we had a fairer or flatter tax code, no such planning would be necessary. Obama’s proposed $3 million limit may seem like a lot of money. Yet even by the government’s underreported Consumer Price Index (CPI), $3 million today has the same buying power as $500,000 in 1970. The dollar has lost enormous purchasing power in the last 40 years. Given actual inflation, the amount is even more. Assuming 4.5% inflation, a 20-year-old starting to save for retirement today will need a $9.97 million portfolio value at age 65 to have a lifestyle of $60,000 in today’s dollars. Given the natural volatility of the markets, capping any appreciation while leaving the downside risk is extremely unfair. No legislation should inhibit individuals from taking care of their own retirement. Government officials know very little about retirement planning. They haven’t even had the foresight to keep Social Security solvent. The proposal is political maneuvering rather than a serious budget proposal. It is intended to push the socialist idea that raiding personal retirement investments is as legitimate as confiscating Cypriot bank savings when the government needs money. Although there is little chance of it becoming law, there is also less outrage and backlash than there ought to be. While I don’t share some of your more hyperbolic commentary, I would agree with your argument that this is not a particularly fair or reasonable way to address the need for government revenue. A much better way would be to simply increase taxes on those whose incomes exceed the $205,000 figure that the president assumes a $3 million portfolio could generate. This way, if you pull more than that amount from your retirement account in any given year, you’ll pay a higher tax rate on the overage, but if you pull out less you won’t be hit by the higher rate. But I suspect that you wouldn’t support that idea….